WordPop! for iPad – Who’s iPad is it? The iPad is being marketed as a very casual device as demonstrated by Steve Jobs on stage while sitting on a couch. The only way he could have looked more relaxed would be if he was in a t-shirt and boxers drinking a beer. His point was well taken by many including my team, the iPad will be used in the living room, den or some other communal space. This makes the iPad a shared device. Let me say that again, unlike the iPhone, which you might loan to someone for a brief moment, such as a friend at a coffee shop, the iPad is meant to be a shared device. What does this mean for WordPop!? We’ve concluded that WordPop! will be shared among family members or friends, thus we will need a sign-in. This will allow several family members to start and play their own games and it will allow individual players to save multiple games. This is fantastic feature. One game could be played with the goal of getting the highest score ever on Medium Level while another game could be dedicated to making high scoring words for the Global All Time Best Words List. Even better, another game could be saved for a child who wants to practice making words (we’ve heard from several parents they use WordPop! in this way). Another advantage of having a sign-in is we can get a name up front for the High Score and Best Words pages. I for one can’t wait until Wyatt finished with sign-in as I too want to play several games at once each with a different goal. If you are a developer and thinking of having sign-in make sure to plan this up front as it is a complicated feature if not thought out early. You will want to list out which items are saved per player and which items should be global, such as posting scores to our server. If you would like further information about our sign-in flow, please feel free to email me. 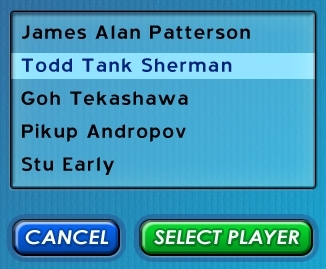 http://smartboxgames.com/wp-content/uploads/2017/01/sbg_logo_whitetext_trans-1030x259.png 0 0 Todd Sherman http://smartboxgames.com/wp-content/uploads/2017/01/sbg_logo_whitetext_trans-1030x259.png Todd Sherman2010-03-15 16:03:182010-03-15 16:03:18WordPop! for iPad – Who's iPad is it? When Jim, Wyatt and I were redesigning WordPop! for the iPad we asked ourselves what additional elements would engage and entertain our players in addition to the game itself. One answer was game statistics. The Best Words and High Score Global List stats are very popular among WordPop! players. They compare the player’s current game and words to other players, which then acts as an incentive to do even better as you want to beat the current high score or best word on the global list. However, the stats were hidden in the menu (two taps away). By moving the stats out of the menu system and onto the game board would result in “Flattening the Design“. However, we all felt it was not enough to just move the existing stats. Thus we decided to add more fun stats, many of which were recommended to us by players of WordPop! for the iPhone. When the iPad version of WordPop! is released, players will be able to compare their game to several new, important, and exciting stats that will act as another incentive per round and word to do better. iPhone, iPod Touch, Smart Box Games, WordPop! My team and I created WordPop! for iPhone. Like many developers we decided to create a “free” version of our game so potential players could try it before they purchased. Over the last six months I noticed ratings for our free version was lower than our paid version. I wondered if other developers were having the same experience. I did an analysis of the top 20 best selling games in November in the Games: Word category. I compared the ratings from the Paid version to the Free Version. If the paid version had an average 3.5 rating and the free version had a 3.0 rating, then there was a .5 negative change. Not one application had a better rating for the free version and 45% had worse ratings. Then I was curious if ratings determine if an application will be a best seller. I was surprised that 65% had 3.5 or worse rating. Although a small sample and taken from the Word Games category I came to the following conclusions. 1. Creating a free version was once thought of as an important strategy to getting noticed and to be a top seller. Since almost half (45%) of the top selling word games do not have a free version I no longer think this is true. All in all, as a developer I no longer believe it is critical for my team to create a fee version to drive sales or to become a best seller. And I think the costs to make the free version may not justify the return on investment (ROI). You can read more about our game WordPop! here and the free version, Diet WordPop! here. iPhone, iPod Touch, Smart Box Games, Word Games, WordPop! You loved it on the Palm, you played it on Windows Mobile, now get it for your iPhone or iPod Touch. New look, new interface, but same refreshing word game. iPhone, iPod Touch, Palm Addicts, Smart Box Games, WordPop! I recently downloaded Wordpop for my iPhone as I have played this game on my Palm device and thoroughly enjoyed the iPhone experience. After I downloaded from the App Store I immediately liked the user interface and thought I would share with you my thoughts and opinions on the game and give you an insight on how to play as well.Firstly you have to pick which setting you want to play the game at easy, medium or hard for first time players I suggest you choose the easy mode until you get used to how the game works. Also for first time players there is a how you can play button this is very useful and gives you full instructions how to play the game. Once you have chosen your difficulty level for the game you enter into the main game board at the top of the screen you will see what round you are on and the total amount of points you have accumulated. Below this a rectangle box spells the word you have just created alongside with the point value, then at the side of this you will see a grey circle with a tick in the middle when you have spelt a word and the word is a proper word it will illuminate yellow. Below you will see the quit button and an undo button which is explanatory. In the middle of the screen you will see the main grid which is full of cubes each with a letter and in the bottom right corner of each cube you will see a number this indicates how many points you will get for creating a word with this letter. Finally at the right hand side of the screen you will see three empty cubes these can be used as any letter to help you create more words when you are running out of needed letters. The aim of the game is to spell as many words as you can out of the letters provided, when you have found a word you want, tap on the first letter or the word then tap on the next and so on till you have created the word. When you have spelt the word the tick should illuminate yellow and you should get an indication on how many points you have received. Select if the tick is yellow click on it and the word will disappear from the screen and your points will be added to your total. 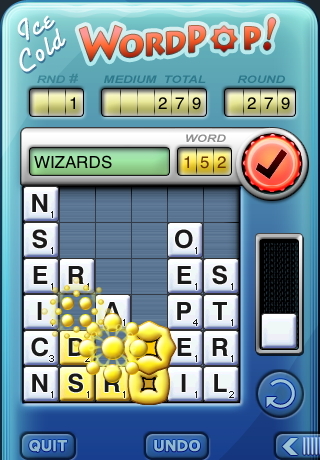 Continue to create words from the grid to build your points up and if you get stuck don’t forget the spare cubes on the right hand side of the screen they become very helpful near the end of the round when you have used most of the letters. If you want to rearrange the letters just give the iPhone a slight shake and the cubes will mix up helping you to try and create more words. To move on to the next round you have to use up every letter from the grid it may sound easy but it is realty Z which will earn you more points. So far I have managed to get to round four which I found difficult to get to the best thing about this game is your not against the clock so you are not rushing to try and create words before the game is up.